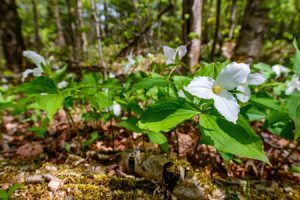 Why is the Trillium flower our symbol? Trilliums are widely viewed as a reminder of the Holy Trinity: God the Father, Son and Holy Spirit. The message symbolized by the trillium is simply that God loves you and is eager to forgive your sins. The Trinity is one God, showing love to the world in three persons: Creator, Redeemer and Transformer. Three working as One, and One working as three, to share love, hope, and joy with the world. Come and join the dance of Trinity – the dance of our God in three persons, dancing with us through life. Our faith is not confining. We are dancers going hand from hand, swirling around each other, dancing do si dos, weaving in and out of each other following the Lord of the Dance and listening to the calling of the Spirit.